Children may not be able to detect vehicles approaching at speeds in excess of 20mph, according to a new summary of peer-reviewed research. The review is the latest in a series of ‘essential evidence’ summaries prepared by Dr Adrian Davis, a visiting professor at the University of West England, to help disseminate academic research to road safety practitioners. 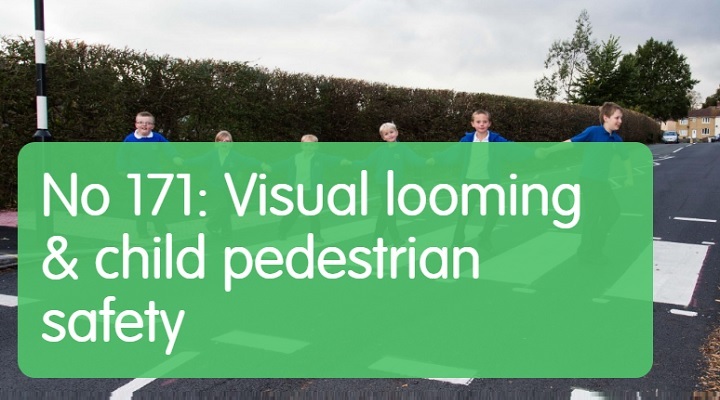 In his latest summary, ‘Visual looming & child pedestrian safety’, Dr Davis says children in urban settings are at risk when traffic speeds are higher than 20mph – as they may not be able to detect approaching vehicles. Dr Davis adds that the risk is ‘exacerbated’ because a vehicle moving faster than 20mph is more likely to result in a pedestrian fatality in the event of a collision. Across the globe, pedestrian injuries are the third leading cause of death for children aged between 5-9 years. Dr Davis notes how a child’s visual limitations in gauging speed and distance are cited as a ‘key deficit’ contributing to such injuries. In the UK there are more than 6,500 pedestrian casualties per year, and 30% of pedestrian deaths are children aged 0-15 years. Dr Davis points to a study led by researchers from the University of London and published in 2011, which he says is the first to demonstrate that a person’s visual perception – essential for skills such as catching and hitting a ball, and crossing the road – is not fully developed until adulthood. The researchers found that children ‘could not reliably detect a vehicle approaching at speeds higher than approximately 25mph’ and did not ‘reach adult levels of perceptual performance under most viewing conditions’. Dr Davis says these findings have important implications for road safety policy – in terms of the upper limits of vehicle speed that allow children to make accurate judgments – supporting the case for reduced speed limits outside schools and in other areas densely populated by children. In his conclusion, Dr Davis says that driving in excess of 20mph in a residential or school area not only ‘increases the potential severity of any impact with a pedestrian’ but also ‘increases the risk that a child will injudiciously cross in front of the vehicle’. Police officers do not all share the same views Bob -some may agree with you, some may say (as I do) that the driver should bear ultimate responsibility for collisions with much slower-moving road users. Some officers understand the problem better than others. Hugh as regards to your reply to my last input. If you ask any police officer involved in road safety they will all say the same thing that its the responsibility of ALL road users to keep themselves safe on our roads. That includes all pedestrians and in particular those that would wonder into the road without any due care and attention or reasonable consideration towards any close approaching traffic. Lowering speeds will possibly exacerbate the danger as its more than likely that drivers travelling slower, possible in traffic, will lose concentration and suffer greater distraction, drive far to close to the vehicle in front to be safe and lose the advantage of forward vision of the road ahead and will also lack peripheral vision. So when all that occurs tell me then if a slower speed will bring road safety benefits in the future. Speed at times needs to be slower and /or space needs to be greater for the sake of road safety. These are several of the reasons that I doubt whether reducing road speeds in general will in fact lead to a reduction in collisions. I agree that it will mitigate some degree of injury. I agree with driving at lower speeds for that reason. However collisions will still happen and maybe with less space and visibility afforded to ALL road users I doubt if collisions will reduce but as a result may actually increase. We seem to exchange comments, opinions, facts and statistics fairly frequently on RSGB and often (but not always) come from vastly different perspectives, hence our disagreements. However I have no need for you to know me or my position better than you do now. Neither of us is persuadable to the other’s view and I am content for that to be so. It really must be my last post on this thread but I’m sure we will encounter each other in the future even if it is only here. I can’t argue with the logic of Pat’s latest comment purely in terms of speed reduction, however in terms of road character, purpose and typical informal mix of road users – not forgetting that people actually live in the buildings bordering the roads – then a 20 limit is the appropriate limit. I think it’s about creating a climate of respectful and considerate driving towards those who live and use these roads and not just collision reduction. One other thing – as in Pat’s example, a driver habitually driving irresponsibly along one of these roads at say 30mph when the average is say 20mph, would not theoretically be brought to book – whilst it’s a 30 limit – however if it should reduce to a 20 limit they could, with the aid of selective and intelligence-led enforcement be caught. If a local resident, word would spread. I do apologise. I am obviously not making myself clear or you are purposely avoiding answering the questions posed. I am trying to ascertain whether your objection to signed only limits, which may or may not be fully compliant, is restricted to 20mph or no. Is it a general dissatisfaction with speed limits which may be non-compliant or is it 20mph limits in particular? If it is only with regard to 20mph limits, what is the reason for this? Is there a level of non-compliance that triggers your objection, or is it a percentile speed that is your issue? I am happy to debate this but am still unsure of your position. May I also suggest that if you do want to engage in a debate on this then sooner or later you need to drop your “bloke from Wales” identity and be a little more specific. I do have a major issue with ineffective and non-compliant signed only 20s where the speed reduction is minimal and the average speed after the “intervention ” is still considerably above 20mph. Vehicles speeding in a 20 makes a mockery of a scheme and if that is forecast to be the likely outcome, the scheme should not have been approved at the outset. There are many of those and I consider them not fit for purpose. Occasionally pre-scheme average vehicle speeds in a 30mph limit may be around 20mph and in those cases a signed only 20mph has a fair chance of being successful and has my support. Do you think the DfT Atkins report will come to a definitive decision on 20s v 30s or will it record a split vote? It’s the vehicle driver who is capable of doing harm to the vulnerable and unprotected pedestrian Bob and not the other way around, which is why responsibility has to be with the driver. Pedestrians are not invisible and do not suddenly ‘beam down’ on to the c/way in front of the driver – they can be seen and it’s very poor driver who is not able to react to that. Lower vehicle speeds, either imposed or voluntary, should ensure that. As an aside, where Stats 19 says ‘pedestrian did not look’ – according to who? the driver by any chance? i.e the one who didn’t stop in time! So to clarify, you are against any 20mph limits unless they have engineered physical traffic calming! Is that correct? Does your opposition to signed only limits only apply to 20mph or are you equally opposed to signed only 30, 40, 50, 60 or 70mph limits? If so, what is the defining factor in you opposing a signed only 20mph as opposed to a signed only 30mph limit? And lets bear in mind that 30mph limits currently have far fewer signs than 20mph limits. In reality Hugh you seem to be blaming the driver for all ills and that is certainly not the case. By your arguments now and in the past we may as well go back to the days of 4 mph and a man with a red flag walking in front of all vehicles. It is rarely the case that vehicles jump onto the pavement to collide with pedestrians as its usually the other way round. Therefore there is some degree of blameworthiness on the part of some pedestrians that place themselves in such an insidious position. Even if vehicles pulled back to a safe following on or stopping position and was following traffic at an appropriate speed then if a pedestrian walks into its path and due to close proximity there is insufficient space to stop in then the driver will generally not be found to be to blame by the police. If however the driver was say merely the thinking distance [ approx 1/3rd of the recommended stopping distance ] then the driver could be considered to be at fault under those circumstances. I meant in reality Pat…i.e. it’s the most pertinent factor in most collisions. Saying a ‘Pedestrian failed’ to look is not necessarily absolving the driver of responsibility. I’m not going to argue with you on the term. It is a stats19 definition and interpret that as you will. I am happy to confirm the position I have held for several years that I fully support specific localised evidenced based 20mph speed limits that have vehicle speed reducing engineering measures where applicable (i.e.in most instances) all for the purposes of road casualty reduction. Signed only default 20s don’t, in my opinion, fit into that category. As for the ‘proper’ debate, we will all have to wait and see how that pans out. Pat: From one of your earlier comments highlighting “Pedestrian failed to look”….another way of putting it is “Driver failed to stop in time”…shouldn’t that be of far more concern and be given priority in reducing collisions? With that in mind, I don’t understand why a road safety officer would not support meaures to lower speeds, so is it simply the principle of signed-only 20 limits that you think ineffective and disagree with, or the principle of 20 limits for residential areas per se, however that may be achieved? What would the ‘proper public debate’ be debating exactly and …why? A certain recent referendum convinced me that that the ‘public’ are not necessarily qualified to pass judgment on subjects they may not have any expertise in. No delusions of grandeur Pat. The debate started long ago in Wales with the capital city adopting wide-area 20mph limits. Already more than half of the largest urban authorities in the UK are implementing 20mph for most roads. Our conference is the ninth that we have held and this year we are coming to Wales because of the interest from Welsh communities. What we are showing is the experiences of places which have done wide-area 20mph limits. If you don’t want to benefit from that experience then that’s fine. Our conference prices are what they are and offer good value for money for cash-strapped authorities and organisations. Rod, Don’t get delusions of grandeur. I’m talking about the proper public debate on 20s that is coming up in Wales, not your happy club one. I wouldn’t expect that debate at your conference to be particularly insightful. I suspect many of the ‘others’ that don’t agree with default 20s will also ‘pass’ as they don’t see the point in coming to your party at all, even with the super duper discount you are offering on delegate fees. By the way, why didn’t you offer the same lower flat fee to everyone? It was your phrase ‘Children are being driven off the roads by the way we drive our motor vehicles’ Rod, which I thought was a bit over the top anyway, but I presumed you meant playing in the road, the principle of which has been argued about previously here. I was trying to make the point that it is not just the speed of traffic or the speed limit that ‘allows’ such activity but the frequency of passing vehicles and in my road, the level of children ‘using’ the road will not increase, if and when the limit reduces, as the amount of traffic will not change, nor unfortunately, will their speeds. Hugh and Rod. Its not necessarily a careless ‘speeder’ that creates the problem for anyone playing out on the street its just the ‘careless’ driver. They don’t have or need to be speeding, just careless. That’s driving without due care and attention or without reasonable consideration for other road users. That offence does not necessarily have to include an element of speeding at all. That is only part of the problem. The other is the kids playing out unsupervised on streets that are there for the purpose of the passage of persons and carriages, including goods and chattels. Back yards, gardens rear and front of a property are a more appropriate space in which to play with a greater degree of safety. The debate has already started so, welcome! I can’t help but see some bias in your description of the debate. I was more thinking of children simply “using” a road. Looking at car adverts one could presume that it is drivers who seem to be doing the most “play” in the roads. Surely isn’t every speeder “careless” in driving at a speed higher than that legally allowed. Yes, Cheshire West and Chester is one of the many traffic authorities who have rejected the national 30mph limit for restricted roads as no longer being fit for purpose. Rod – I think it’s not the vehicle speeds necessarily, but the perceived or presumed frequency of traffic that deters – or not – children from playing in the road. Residential roads, especially cul-de-sacs, are perceived as being ‘quiet’ and therefore wrongly presumed to be less risky for children to play out on, however as we know, it only takes one careless speeder to collide with a child who had perceived the road as being ‘safe’ to play on. Coincidentally, today I received a flier from the Council (Cheshire West) through my letter box confirming their intention to implement proceedings to make my road and neighbouring roads 20 mph in the very near future. When in place, I guarantee there will be no increase in children playing in the road, cycling and pedestrian activity, beyond what it currently is now, with a 30 limit. Facts are best used in context and Dr Davis’s ‘Essential Evidence’ sheets are sometimes putting a pro-default 20s gloss on the facts that are otherwise neutral. Looking forward to arguing the points on signed only default 20s versus specific evidence based 20s in the upcoming public debate in Wales. Not, I hasten to add, at your Cardiff conference though. You can keep that as a pro default 20s happy club. It is going to be an interesting few months in Wales. The fact that Dr Davis has a history of supporting 20mph defaults does not detract from the veracity of his opinion at all. Especially when the criticism comes from someone who has a history of opposing 20mph defaults! Whilst accepting that the last 20 years (and the previous 20 years and the 20 years before that) have seen a significant reduction in child death and injury, surely this is irrelevant unless you believe that the current level is acceptable. What we do have to accept that much of that reduction is due to a reduction in exposure and an increase in the quality of trauma care. Children are being driven off the roads by the way we drive our motor vehicles. The 20mph default program recognises that 30mph is no longer fit for purpose as a way for pedestrians and cyclists to co-exist with motor vehicles. Which is why WHO, OECD, EU, ETSC, iRAP and the Global Network of Road Safety legislators all call for 20mph or 30kmh where such co-existence is necessary. No. Its not possible to say when a child will have the cognitive ability to use the looming image of a vehicle to detect its speed. It will depend on a wide number of factors both in their own development and also their exposure to assessing such images. The “looming” was also dependent upon the width of the vehicle, hence it is harder to assess the speed of a motorbike than a car. In order to learn children need to experience looming and speed assessment in order to become reliable at it. As the Essential Evidence points out the faster a vehicle is approaching the more difficult is the process of assessing the speed to such a level that children cannot reliably assess the speed if the vehicle is above 20mph (and this may be even lower for a motorbike). When looking at elderly accuracy in assessing speed from a looming vehicle. They found that the accuracy trailed off above a certain age and this profile of ability v age matched that of T-junction crashes v age where a driver pulls out into the path of an oncoming vehicle. This report brings nothing new to the road safety professionals. Current ETP training schemes address it in varying degrees as previously mentioned. Where do we go from here? – We thank Dr Davis and carry on as the RS professionals have a better handle on this than the academics. p.s. can’t resist a plug to make road safety a mandatory primary school curriculum subject. Can anyone tell me the age at which a child has developed the cognitive ability to differentiate between a vehicle approaching at 20 mph as opposed to 30 mph. or for that matter any speed from say 10 mph upwards. Can adults suffer from the same problem? On one hand we are teaching our children how to ride bikes on the road at the age of 7 years and so one could argue that they can discern the difference at that age. If not then they would be dangerous out on our roads on a bike. Even riding on the pavements and crossing a road could be a problem. On the other hand according to Highways England the second to the top contributory factor for casualties is failing to judge others path or SPEED and with regards to speed that is certainly the case when it comes to cyclists and motorcyclists. Here we are talking about adults of any age not being able to judge approaching SPEEDS correctly. Can anyone actually understand what M Worthington is talking about? Have you misunderstood Mr W.? That’s exactly what I said – only in one paragraph. What is ‘the other way round’ in your first line? Hugh. Maybe it’s the other way round and it’s that many drivers cannot judge the safe stopping distances at the speeds that they are doing. That being said that figure is vehicle to vehicle and not related to anything that may occur within those vehicles. That said Safe distance would reduce the occurrences of pedestrians being collided with due to improved visibility afforded to all.. If more vehicles are the safer distance behind each other then all drivers have a greater and all road users would have an improved view of potential dangers. If a pedestrian steps off or runs off a kerb within that safer stopping distance depending upon the distance involved a vehicle could still be liable to run into him. However with greater visual space being made available a pedestrian has a better chance of seeing the oncoming vehicle, a view that may have been blocked by a larger vehicle in front and if the following vehicle was tailgating. With safer space the driver would have a greater opportunity to see the pedestrian before he or she stepped into his path and would be able to slow and stop and avoid the pedestrian or in the event of colliding him the degree of injury sustained would be reduced due to a slower speed. Of more significance and concern is the fact that many drivers equally do not seem to be any good at judging their own speeds and their own stopping distance. If they did they wouldn’t be colliding with pedestrians in the first place. This means around 67% reduction in child pedestrian casualties whilst at the same time around 40% increase in cars on the road and around 20% increase in traffic volumes. Casualty reduction achievements which are not to be under valued, however always more to do. Summaries of “academic peer review papers” are losing more credibility every day. It often seems like cherry picking other people’s work to bolster one’s own pre-determined views. If you read thee report properly it mentions stats for children up to 9 years of age and goes on with a stat regarding persons up to the age of 15? Now which is it that we are talking about? 9 or 15? I would have presumed that someone of 10 or 11 years of age would have the cognitive ability to judge approaching speeds or am I mistaken. Dr.Davis talks about pedestrians or more about children all over the world as if we are interested of what happens in say India or Bolivia. Surely he can support his conclusions or rather the conclusions his paymasters want by just relying on and reporting on our own UK stats. That is unless he can’t. otherwise able-bodied grown-ups who, for whatever reason also cannot judge speeds and/or are distracted? Once again we’re ignoring the elephant in the room and instead highlighting ‘flaws’ in vulnerable road users’ perception, rather than those of the motorists in their killing machines. If I see a child or any other pedestrian near the kerb or trying to cross the road, I don’t waste time considering whether they can accurately judge my speed, I adjust it to suit their actions. The challenge then for the road safety professionals is to actually implement a reliable and sustainable model that will ensure appropriate traffic speeds at all times. We could make a good start by identifying locations in our respective territories where there are rarely, if ever, any significant road use injuries and where the road is generally considered to be user-friendly for all modes of traffic and where users of different modes co-exist in relative harmony. We could then try to identify which characteristic or characteristics of those locations are absent from the locations where things aren’t quite so hunky-dory. I suspect that speed limits, per-se, will be ruled-out as a defining characteristic of the locations which are the most desirable places to have to use the roads. Children’s lack of ability to judge the speed of approaching vehicles with any accuracy is well know to RSOs and has been for a very long time – if an RSO does not know that, I would question whether they are fit to do a road safety officer’s job. Many RS ETP schemes explain this to children and Kerbcraft in particular teaches this in a practical roadside setting. That is one of the reasons why Welsh Government support Kerbcraft as an ‘approved’ core ETP scheme and have done so for around 15 years or so. Nice of the academics to catch up with the professionals though. Dr Davis has history as a pro-default 20s supporter and I would not expect anything different from him. Obviously I can’t agree that this issue automatically leads to a justification for “default 20s”. We have seen absolutely massive reductions in child road casualty statistics over the last 20 years without default 20s thank you very much. Those child casualty reductions are probably partly due to considerable investment in SPECIFIC evidenced based, engineered, local 20mph speed limits/zones and safe routes to school.